Boyds Mills Press, 9781590789834, 216pp. Lola's back! She patched things up with frenemy Amanda Anderson, but it's not happily ever after for these two best friends, at least not yet. Lola doesn't want to share Amanda, especially not with Jessie, who seems to be around . . . all the time. Can there be more than two best friends? And what does a wild chicken have to do with anything? Hint: The answer involves a class trip to a farm. When Lola is around, you never know what will happen next. This second book in Christine Pakkala's dynamic series is sure to capture the hearts of readers who love a spunky heroine and some unexpected antics. Christine Pakkala has an MFA in Poetry from Iowa Writers' Workshop and has taught seventh- and ninth-grade English in New York City. 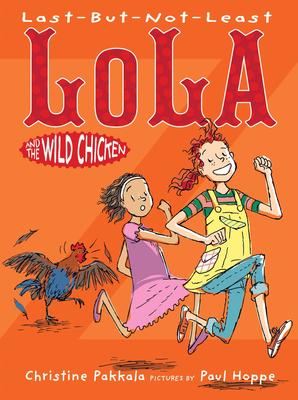 Last-But-Not-Least Lola and the Wild Chicken is her third novel. She lives in Westport, Connecticut. christinepakkala.com. Paul Hoppe is a New York-based illustrator, designer, and author who teaches at the School of Visual Arts. He is the author-illustrator of two picture books and the illustrator for several other picture books and young adult books. His work regularly appears in the New York Times and the New Yorker. Born in Poland and raised in Germany, he now lives in Brooklyn, New York. paulhoppe.de.